Equine Fluid Therapy is the first reference to draw equine-specific fluid therapy information together into a single, comprehensive resource. 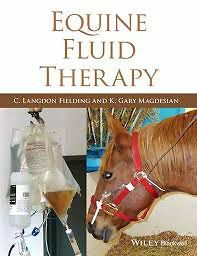 Offering current information unique to horses on the research and practice of fluid, electrolyte, and acid-base disorders, the book is designed to be clinically oriented yet thorough, providing detailed strategies tailored to equine practice. With information ranging from physiology and acid-base balance to fluid therapy for specific conditions, Equine Fluid Therapy covers fluid treatments in both adult horses and foals, highlighting the unique physiologic features, conditions, and differences in foals. Well-illustrated throughout, the book begins with an overview of the physiology of fluids, electrolytes, and acid-base, then moves into practical information including equipment, monitoring techniques, fluid choices, and potential complications. A final section offers chapters on blood transfusions, colloids, parenteral nutrition, and hemodynamic monitoring. Equine Fluid Therapy is an essential reference for equine practitioners, specialists, and researchers.